There are times when solo mind mapping is acceptable and even preferred. Setting personal goals or mapping out a personal project are best done solo. It is also great to use mind mapping as a way to clear your head of all the clutter so that you can focus one thing at a time. The tool you use to mind map is a personal preference. If you are working at your office (home or other) a whiteboard is a great medium for mind mapping. However, it’s often difficult to take with you and modify or expand upon. I prefer to use a software program like FreeMind. It provides the flexibility I need as a mobile worker and allows for extending or even sharing when I need the power of collaboration. Double your creativity with collaborative mind mapping. Mind mapping alone nurtures creativity and collaborating with others on projects also results in greater outcomes than when working alone. Mash these two together and you can more than double your output. The benefits of collaboration include: bringing multiple perspectives; inspiring ideas in one another; increased energy; interconnectedness; and shared goals. One of the most energetic types of collaboration is mind mapping. As with mind mapping alone, it can be done on a whiteboard or flipchart or it can be done with software. The benefits of using software are increased exponentially when that software is web based. Using online software solutions such as MindMeister provides not only the benefits of mind mapping, but allows for the collaboration to take place with anyone in the world. Your creativity potential just shot through the roof! Start in the center with an image of the topic. Select key words and print. Use single works or images for each idea / line. Lines are connected, starting from the central image and get thinner as they radiate out from the center. Use multiple colors for visual stimulation and to distinguish a group. Keep the Mind Map clear by using radial hierarchy, numbers, or outlines to encircle the branches. What better way to experience the guidelines of mind mapping than through the visual representation of a mind map itself! So the next time you need to tap into your creative power, invite a friend and double your creativity! 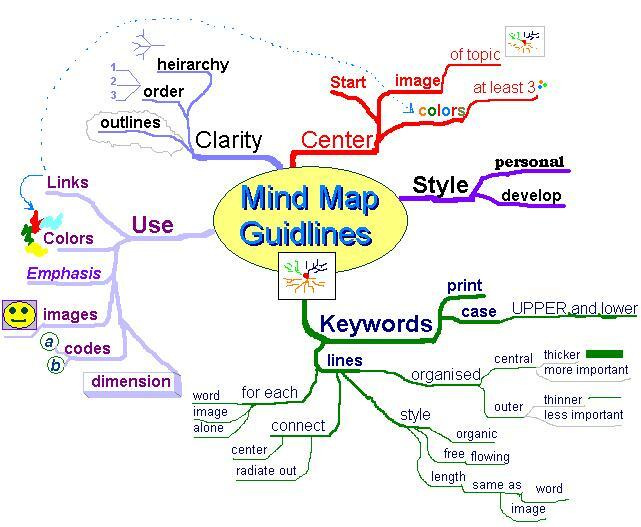 Use mind mapping for planning, brain storming, studying, lesson planning, writing, presentations, event planning, strategic planing, or other things I haven’t yet discovered!